Until now, information in foreign languages related to real estate transactions was very limited and available only on the Internet or in English newspapers. 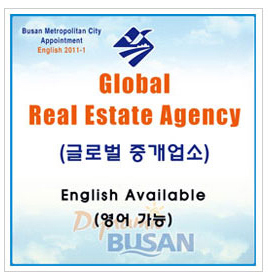 Busan Metropolitan City has now designated some real estate agencies as having proved their ability to provide services to foreigners in English, Japanese or Chinese as 'global' agencies, as part of the city's efforts to establish a more convenient living environment for foreign residents in Busan. Anyone needing consulting services in English, Japanese or Chinese when dealing with real estate matters may find the following information useful.